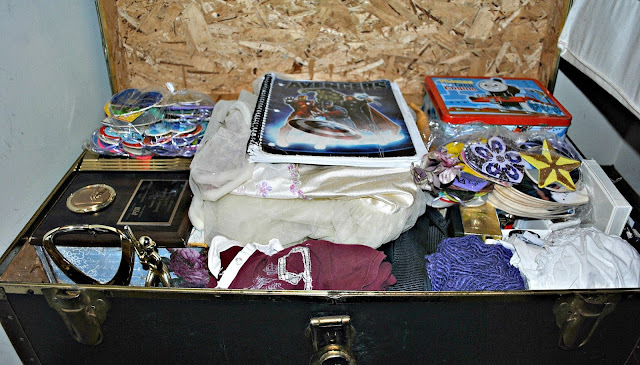 While sweet tears slid down my face, I emptied my college trunk of teaching curriculum I’d written. Then I began to repack it, tenderly positioning each reminder of Jenna and hoping every memory I needed to keep would somehow fit. One month later I walked into Riverside High School. 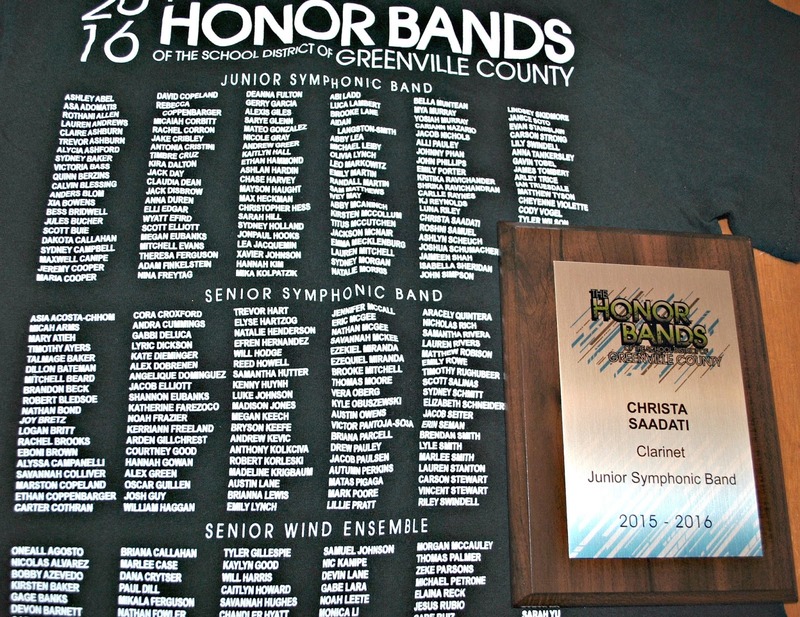 Although only in seventh grade, my younger daughter, Christa, had been selected to play in Greenville’s All-Region and All-County bands. The familiar sight comforted me. Happy memories from four years ago returned from when I’d come to hear Jenna perform during her eighth-grade year. I headed toward the auditorium. To the left stood a souvenir-stacked table. I picked up an overpriced tee-shirt and, on the back, located Christa’s name before returning it to its place. Moving down the line, I saw the boxes of preprinted plaques and recalled the unfair parental trick. I knew better than to find my daughter’s and pick it up—knew that after reading the inscription I wouldn’t want to put it back regardless of its outrageous amount. Nevertheless, I decided to search. My eyes scanned the alphabet’s end: Alex Tedrow, Erich Threlkeld, Ethan Wells—teens I’d known from when Jenna was in band. Then it hit me like a punch to the gut. Jenna should have been a senior. Her name most likely would have been there. 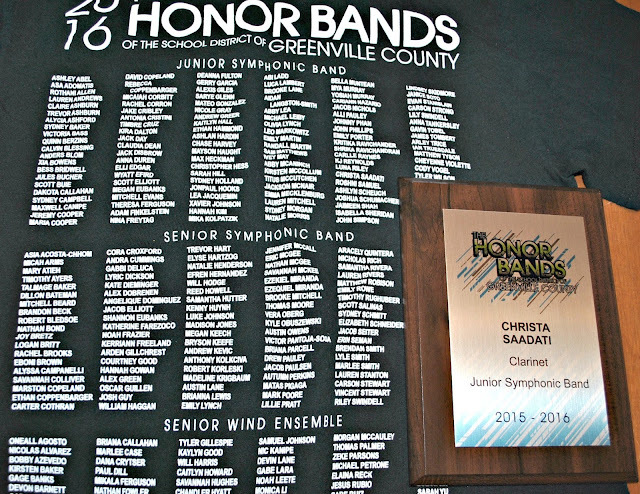 Chances are she would have concluded the concert with the senior ensemble’s Star Wars excerpts, and beamed with sisterly pride when Christa’s junior ensemble opened with John Williams’ theme song. In the midst of healing and closure—if you can call it that—I shuddered to think I’d forgotten. Needless to say, I fingered the plaque and re-palmed the shirt, continued to the checkout, and chose to go home a little poorer. Neither was I. But Christa deserved the gifts; she was worth more than they cost. And, the obvious absence of Jenna’s name was accompanied by a heart-cry—to Christa and the others whose names lined the shirt—that said stay. Because you can’t pack a life in a trunk. Beth, every time I read your words, I'm reminded again what a gifted writer you are. Through your transparency, you draw me into the reality of your life and the lives of many other families who have suffered the devastating, unimaginable loss you've experienced. I pray God's continued healing and blessing as you reach out to hurting families who walk this journey with you. I love your heart. Thank you for allowing us a glimpse of your precious Jenna. I know she was a caring, compassionate young woman who made a difference, even in her short life here on earth. These words--and the timing of them--were perfect, Vonda. I can't tell you how much they mean. Thank you for continuing to encourage me on the journey. Once again Beth, you move me to be a better person, a better Christian, and a better friend. There's always a struggle the day after I finish a monthly post. But this reminds me it's worth it. Thank you, Ellen. Beautiful. Touching. Authentic. Thank you for sharing your world with us. Thank you for entering into it, Sharron. I'm humbled that you would. Beth, As I struggle with finding my own new normal, I am moved by your courage for humble heart. The new normal. . . . I loved meeting you last month, April. You encourage me too. Praying peace and perseverance for you through the storms that can be so hard, my friend. May the Father's love sustain you. None needed, Kathy. It's just good to hear from you. Hugs to you and Emma. Brave and beautiful...not just the words but you, forever Jenna's mom with a heart full of hurt sharing healing and hope one heartbeat at a time. You are loved! So powerfully said. Such encouraging words. Thank you, Lori. Beth your words are always touching and make us sensitive to others who have lost a child. 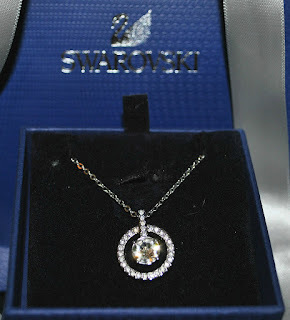 How touching your friends thought of you with the beautiful necklace. Thank you for sharing your words. The arrival of the unexpected gift, sent from friends I'd met a few months before at the CCC conference, was amazing. It spoke to me. Thanks, Daphne, for reading and letting me know. I check the blog every morning to see if you've posted yet. Thank you, Beth. (((hugging))) you from over here. Every morning? Wow. I wasn't expecting to read this. Thanks, Mary. You encourage me! FYI, I generally post once a month--usually toward the end. Maybe that will help. :) Hugs to you too, friend. Beth, such a beautiful piece of writing. I was right there with you in your closet, opening up the necklace, and in the gym. May God continue to grant you grace and peace as you move through the grief. I'm proud to know you, friend. Your ability to carry on is as beautiful as your writing. Same here, Lyneta. I'm rich for knowing you. Thanks for the helpful perspective and constant encouragement--for choosing to walk it with me. Thanks for sharing your heart so well Beth. Lots of people love the Saadatis. Hi to Komron for me. You're welcome. Thank you for such kind words!